The 12th Disney theme park, and largest of Disney’s six Magic Kingdom-style castle parks, Shanghai Disneyland preserves the best of Walt Disney’s original vision while pioneering a host of dazzling new creations. It opened June 16, 2016 to global acclaim. This stunning reinvention of the company’s classic “Magic Kingdom” parks is the centerpiece of the Shanghai Disney Resort. It is a massive and successful, state-of-the-art, world-class achievement with groundbreaking technology and creative design, production and execution. Mickey Avenue, the park’s main entry street, is a playful, timeless introduction to the famous Disney animated characters. Gardens of Imagination offers a serene, landscaped haven at the park’s center, featuring charming rides and a playful interpretation of the Chinese Zodiac as Disney and Disney•Pixar characters. Fantasyland is home to the soaring Enchanted Storybook Castle - Disney’s tallest, largest and most interactive - along with exuberant, new versions of classic Disney animated adventures. Treasure Cove is an all-new, Disney themed land designed around pirates, offering a bustling seaport, stunt shows and a groundbreaking new version of the classic Disneyland ride, Pirates of the Caribbean. Adventure Isle takes guests to a time-lost world where exploration awaits, challenges loom, and a mysterious creature dwells. Tomorrowland celebrates the hope, optimism and potential of the future – themes from the original Disneyland park – with imaginative design, cutting-edge materials and programmable spaces. The new park is a glowing triumph, even by Disney’s own exceptional standards. But perhaps the greatest achievement lies in something intangible. This is the first Disney park built from the very beginning with a deep appreciation for, interest in, and integration of Chinese culture. From the project’s earliest days, Walt Disney Imagineering incorporated Chinese writers, artists and cultural advisers into the creative process. Merging seamlessly with the team in Southern California, and through its own Shanghai-based operation, these new ambassadors brought a deep understanding of Chinese entertainment, storytelling and design. The fusion is everywhere. Chinese influences throughout the park are both immediately recognizable and more subtly incorporated. They are visible in such classic Chinese design as the Wandering Moon Teahouse in the Gardens of Imagination, and the custom Chinese fonts created for themed signage found throughout the park. They’re tangible in the entertainment experiences, which include celebrations of seasonal festivals and stage shows that incorporate Chinese language, performers, theatrics and acrobatics. They’re flavorful, with a menu of food and beverage selections that reflect the guests’ desire for both local and international cuisine. And they’re natural, found in the lush green environments featuring native trees and shrubs from across China that have been incorporated into the landscapes. Voyage to the Crystal Grotto, a Fantasyland river excursion, celebrates classic Disney tales with a magical finale that takes place in hidden caverns beneath Enchanted Storybook Castle. Alice in Wonderland Maze lets guests explore Tim Burton’s manic world in a topsy-turvy outdoor garden. Pirates of the Caribbean: Battle for the Sunken Treasure takes guests on an all-new swashbuckling journey with Captain Jack Sparrow, deep under the sea, to capture Davy Jones’s fabled golden treasure. Eye of the Storm: Captain Jack’s Stunt Spectacular pits everyone’s favorite captain against his fellow pirates and the British Navy — amid a raging hurricane. The Camp Discovery Challenge Trails deliver a breathtaking personal adventure, where special safety harnesses allow guests to climb rocky cliffs, cross dilapidated bridges, and explore bottomless caves. Tarzan: Call of the Jungle uses spellbinding Chinese acrobatics to tell the story of the famous vine-swinging hero, his faithful animal friends, and the brave woman he loves. TRON Lightcycle Power Run is Disney’s newest indoor-outdoor techno thrill ride, launching guests into a high-speed race across the glowing Game Grid. These attractions and many more combine breakthrough technologies and dazzling design to form an entirely new generation of Disney adventures. 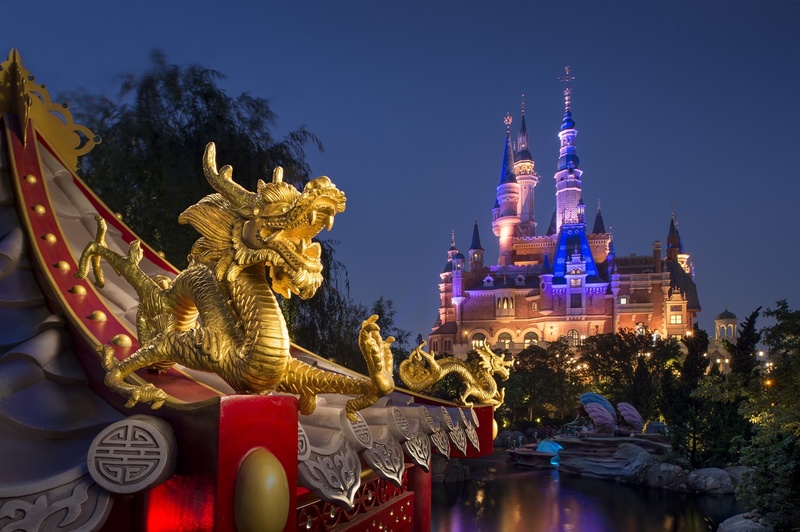 By reaching for innovative new forms of immersive storytelling, while lovingly merging Chinese and Disney cultures, Shanghai Disneyland park achieves excellence on a spectacular, international level.